The Turma! event in Carlisle in July 2018 was intended both as public spectacle and as a piece of historical research. 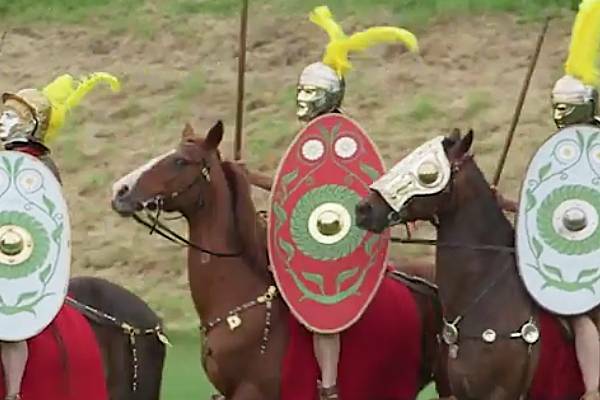 We wanted to expand our understanding of Roman cavalry equipment and the Hippika Gymnasia. These were ritual tournaments performed by the cavalry of the Roman Empire to display their expertise and practice their skills. The Greek historian Arrian writes about them in his manual Ars Tactica. Hadrian also talked of them in his speech to the Roman army of Numidia. The Turma! 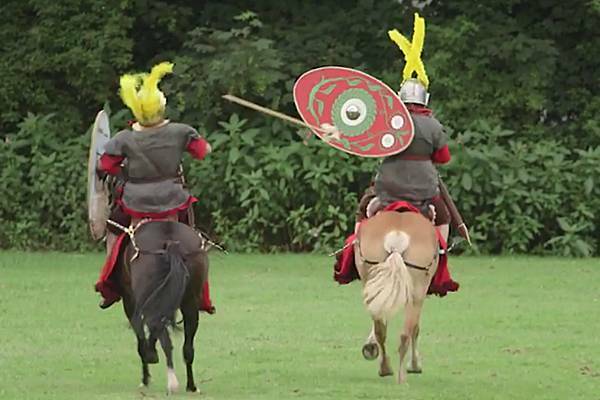 event provided an opportunity to experiment with the practicalities of the Roman saddle. This was designed to provide a stable seat for riding into combat without stirrups. 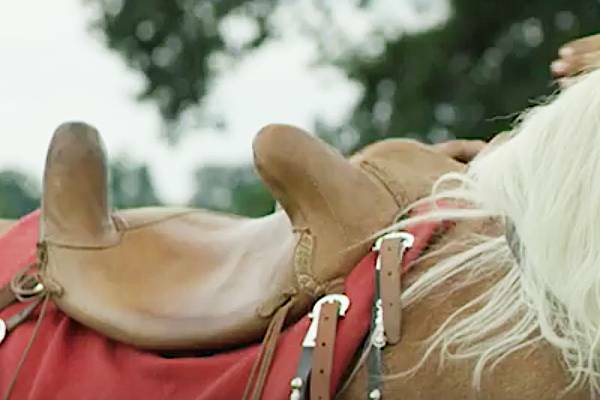 Working examples of the Celto-Roman saddle used by Roman cavalry had only begun to be understood, reconstructed, and tested for the first time in the 1980s. Since then, re-enactors had used them in small numbers. But the dynamic of a mounted group as large as a turma was bound to be different from that of smaller groups of riders. A turma of around 30 men was the smallest tactical component of a Roman auxiliary cavalry unit. It would have formed the basis for battlefield formations and probably patrols of the region around the frontier. Housed in the same barrack block, training and campaigning together, these men would have boasted a distinct esprit de corps within their parent unit. During the practice day for all 30 riders before the main event, it was apparent that they quickly adapted to working together. By the afternoon, they were getting visibly smoother and tighter with every manoeuvre. It was also immediately noticeable to all who witnessed it that, although the arena was quite large, 30 horsemen filled it with ease. 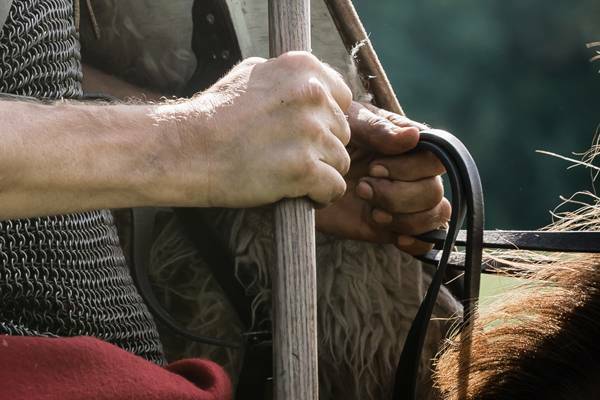 A Roman cavalryman held his shield and reins in his left hand. He used his right hand to throw a javelin, thrust with a spear, or chop with his longsword. For safety reasons our riders used arm straps for greater control over their shields. The competing turmae enter the arena in a simulation of a surprise attack, bursting from cover. A series of group manoeuvres, demonstrating the skills of the soldiers in working together. A focus on the individual skills of the best and most experienced riders. These exercises were originally devised as a competition between two turmae. The Carlisle event comprised only one full turma of 30 riders divided into two squadrons of 15 riders each. In a special experimental session – separate from the public performances – the riders were asked to perform several additional manoeuvres. The full turma arrived in the arena with the Emperor Hadrian at their head and paraded around the arena in two ranks of 15. This enabled the riders to demonstrate their skill in wheeling the two ranks of horses in unison at either end of the arena. This is an important and difficult skill, essential in maintaining formation in battlefield situations. In the experimental session, instead of processing around the arena in two lines of 15 men, the riders were asked to perform it in three lines of 10. This was the way our evidence suggests cavalry in a turma were sometimes deployed. 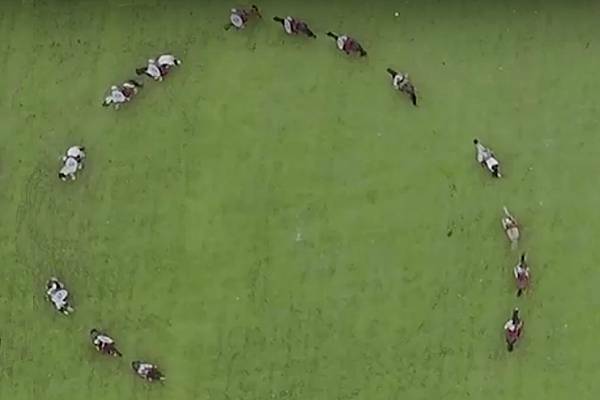 Sure enough, with only a small amount of adjustment, the formation began to gel and showed that this was just as easy for them to do. The two ranks then split to perform two large contra-rotating wheels, known as the Cantabrian Circle. As a battlefield manoeuvre, it was extremely versatile. It could be used offensively by cavalry to isolate an enemy and concentrate hurling javelins at them. It also served a dual defensive purpose. 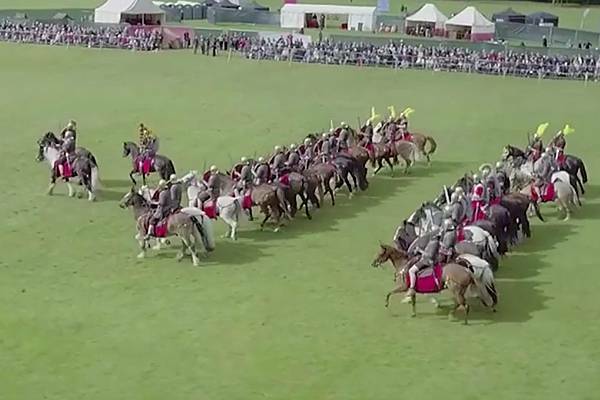 It made riders a tricky moving target and prevented other cavalry breaking through their line since each rider protected the back of the one in front of him. For the Turma! event, only the more skilled and experienced riders carried out the actual attack, following each other round in a circle. Each in turn then hurled their javelins at a target of two cavalrymen in testudo formation. This meant covering themselves and their horses with their shields. The next request made of the riders and horses was more demanding. The wedge formation was found amongst both infantry and cavalry. It enabled troops to break through an enemy formation and split it asunder, almost invariably leading to disarray. This required all 30 cavalrymen to combine two staggered lines into one giant arrowhead, and then process around the arena at ever increasing speeds. They first walked, then trotted and finally cantered. The chase manoeuvre involves riders receiving an attack from opposing cavalry, then immediately attacking themselves, chasing the fleeing opponent and trying to hit them with their javelins. The fleeing opponent would demonstrate their skill in fending off their pursuers by carrying their shield behind them. The Turma! event typified what experimental archaeology is all about. We see what is practicably possible within certain adjustable parameters. As such, it never tells you what did happen, only what might have happened. In all the exercises, the riders quickly learned what needed to be done. They performed the manoeuvres with impressive ease, honing their skills rapidly with each performance.